As a writer with a predeliction for rhyme, I have always relied on a thesaurus and a rhyming dictionary to help me tweak uncooperative and clunky verses. Imagine my delight when Perigee asked me to help them update their classic Capricorn Rhyming Dictionary, first published by Bessie G. Redfield in 1938. In addition to painstakingly checking each entry to add further divisions where necessary, I was asked to add sidebars and reference tools. 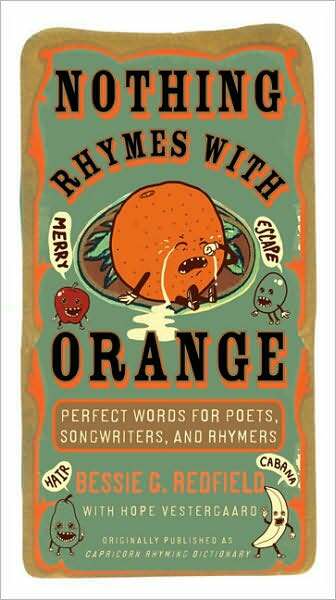 Nothing Rhymes with Orange now includes a cross-reference for different ways to spell the same sounds, a phonetic spelling guide, and brief articles including: Close But No Cigar: True Rhymes vs. Near Rhymes; Partners in Rhyme, a discussion of complementary poetic techniques; All Stressed Out, an explanation of poetic meter; You Say Poe-Tay-Toh: Regional Dialect in Rhyme; Nothing Rhymes With Orange: Near Rhymes vs. Non-Rhymes; and Blinded By the Light: Misheard Song Lyrics. This was a fun (and taxing!) assignment. If you’ve never used a rhyming dictionary, this one will help you kick your writing up a notch…or several!